It took us longer than expected to drive from Los Angeles to Sedona, Arizona. Not because of traffic or car trouble but because once Sedona’s red rock formations came into view, we couldn’t help but stop every few miles to take pictures. 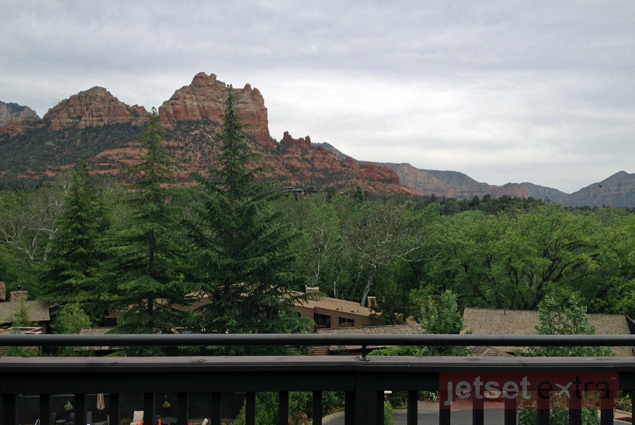 We finally arrived at L’Auberge de Sedona in the late afternoon and were promptly checked into our rooms. My travel companion, editor-in-chief Mary Anne Been, was set up in a Creekside Cottage walking distance from the lobby, while I was whisked away up a hill on a golf cart to my Vista Cottage. Although both rooms are studio style and come with king-sized beds and spacious decks, Mary Anne had access to a wood-burning fireplace and views of the creek while I had a gas fireplace and was greeted by the red rocks when I looked out my windows. 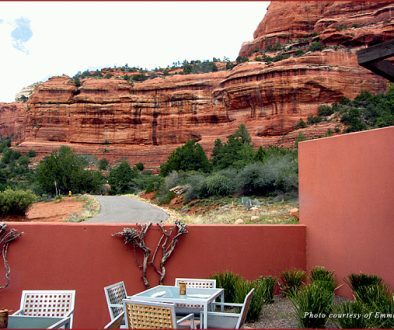 Guests can also choose to have a garden view or stay in a room in the two-story Lodge at L’Auberge de Sedona; the resort sees many return guests who often request their favorite cottage location. All guest rooms come with complimentary high-speed Internet, Gilchrist & Soames bath products, and complimentary coffee and tea. The first thing that caught my eye when I entered my room was the view. I walked out onto the spacious deck that overlooked the sprawling property and the red rocks beyond. It was beautiful and inviting, and it took everything in my power not to order a glass of wine from room service and spend the rest of my evening relaxing on the chaise lounge enjoying the view. Alas, there was more to see and explore so that glass of wine on the deck would have to wait until my next visit. The second thing I noticed was the outdoor cedar shower. A glass door in the large bathroom opened up to three tall walls of cedar that stretched up to an open sky—perfect for rinsing off after a long day of hiking while still maintaining a connection to nature. It was an awesome added touch I had not encountered at a hotel before. Dinner at L’Auberge Restaurant on Oak Creek was suburb from start to finish. We were seated right on the edge of the creek, and the sound of the trickling water provided a soothing soundtrack to the meal. The restaurant’s dinner menu offers diners a choice of three or four courses; Mary Anne and I both opted for the four-course menu in order to sample as many of the delicious-sounding dishes as possible. One by one, each dish came beautifully presented and perfectly portioned: tartar of beef tenderloin with house-grain mustard, fried egg, capers, and griddled focaccia; Dungeness crab crêpe with roasted tomato, fennel, and butter-braised shitake; Brie en croûte with toasted oats, black walnut purée, wild berries, basil, and autumn greens; and mixed greens with strawberries, prosciutto di Parma, almond sablé, local ricotta, and lemon vinaigrette. For our entrées, Mary Anne choose the Creekstone all-natural filet mignon with asparagus, red wine mushrooms, and sauce Béarnaise while I had the red snapper with young carrots, buttered walnut quinoa, stone fruit, and citrus pickled kale. Our dessert choices included a chamomile pavlova with lemon crème, strawberries, pistachios, and honey foam and the Black Forest, with chocolate genoise, toasted meringue, Bing cherry, and vanilla glacé. Executive chef Rochelle Daniel changes the menu with the seasons in order to serve ingredients at their natural peak in freshness and flavor and uses local, regional, and sustainable products when possible. L’Auberge Restaurant on Oak Creek serves breakfast, lunch, and dinner. 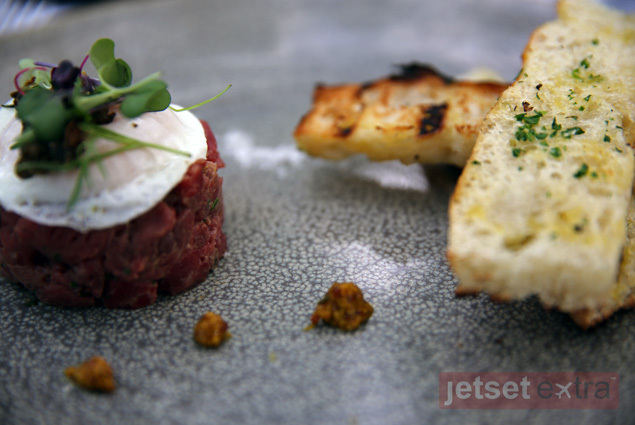 Guests looking for a more casual meal will find it at L’Auberge’s Veranda Bar. 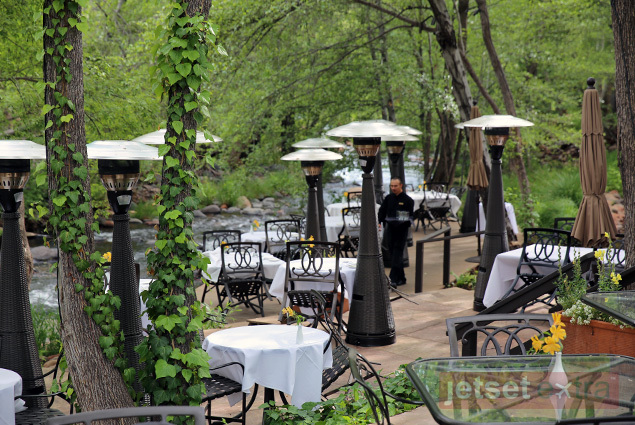 Here, diners can enjoy a lighter menu in an outdoor setting that overlooks Oak Creek. The entire property is set along a stretch of the creek, and guests are given plenty of space to enjoy the scenery. There are benches and chairs strategically placed along a path that runs parallel to the water as well as a large open grass space, which can be booked as the setting for a wedding. The Spa at L’Auberge also makes use of this space, treating guests to outdoor yoga at sunrise and massages in a private cabana at the edge of Oak Creek. While L’Auberge de Sedona offers stargazing several times a week at a spot on property, we had booked our stargazing experience with Sedona Star Gazing. After a dark drive about 20 minutes away from the resort, we parked in a dirt lot and were escorted by our guide to a large soccer field where he had set up a high-powered telescope and binoculars and a row of chairs. It didn’t take long for the cold night air to seep in and make me wish I had packed long underwear and thick wool socks for this excursion. Thankfully our guide came prepared and had big coats and warm blankets at the ready for each of us. As we stared up at the sky, our guide pointed out constellations, satellites, and planets. We took turns at the telescope to get a closer look at Mars and even saw the rings of Saturn. It was a fascinating lesson about our galaxy—although my early wake-up time got the best of me until I could barely keep my eyes open any longer. My advice: Don’t book a stargazing tour the same day you have to wake up at 4 a.m. It’s an experience best saved for non-tired eyes. After a restful night’s sleep, we were up bright and early to conquer the Sedona red rocks. We met The Hike House owner Greg Stevenson and guide Jason Danoff at the store and were given a brief tour of the property, which has everything one might want or need (apparel, snacks, guidebooks) for a successful hike. 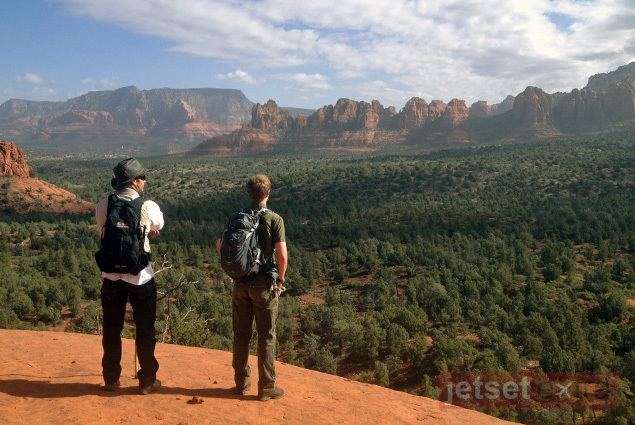 Greg also showed us the Sedona Trail Finder (there are more than 100 to choose from! ), a tool used to help hikers determine which trail is the best fit. Greg selected a three-mile loop, and the four of us set off on our morning hike. Along the way, Jason shared his knowledge of the plants that lined the trail, stopping occasionally to tell us a plant’s name and its qualities and uses. We also paused every now and then to take in the gorgeous views. It was not a strenuous trail, but I felt energized and uplifted as we descended the mountain. My only wish was that we had time to do another hike, as one only served to pique my curiosity. Guess that’s another thing I’ll have to save for my next trip to Sedona. 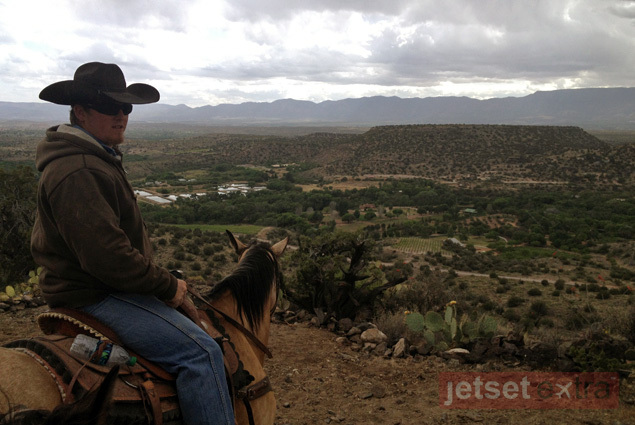 We had a delicious lunch at Oaxaca Restaurant—complete with grilled Arizona cactus with romesco sauce and espinaca con queso—and then headed to nearby Horsin’ Around Adventures to get a view of the area via horseback. The ride began easily enough. I’m not exactly comfortable with horses, but the guides had us helmeted and in the saddle in no time. We moved at a slow gait, making our way down switchbacks along a hill in Camp Verde, about 10 miles from Sedona. Just as I was getting the hang of things my horse, Sid, decided it wanted to head back to start; before I knew it we were climbing the hillside and ignoring the clearly marked trail. Our guide, Steve, immediately took after us on his horse, reined Sid in, and led us back down the trail. It was frightening, but the silver lining is I can now say I have been saved by a real cowboy! After surviving our horseback riding adventure, Mary Anne and I headed back to Sedona, driving away from civilization down Highway 89A to Junipine Resort. The whole day had been a dreary one, but by the time we reached Junipine it was really starting to drizzle so we were thankful to check in to our warm and inviting house—a two-story, two-bedroom, two-bathroom cabin. Each of the homes on the property are privately owned and rented out to families, couples, and groups. They come with a living room, full kitchen, and wood-burning fireplace, and many also have a hot tub out on the wraparound-style redwood deck. It was quiet and private, ideal for travelers who want to leave the world behind and enjoy the beauty of nature. 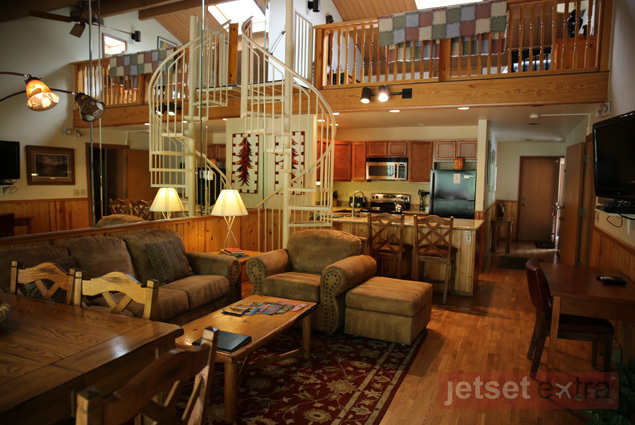 Of course, Junipine isn’t too cut off from civilization; the resort offers complimentary Wi-Fi throughout the property and DirectTV is available in each cabin. As with L’Auberge, Junipine is also located along Oak Creek, and guests can make good use of creek-side tables, barbecues, and games. Guests can also access two hiking trails directly from the resort, which means there aren’t many reasons one would need to venture off the property during a stay. Junipine even serves breakfast, lunch, and dinner at its restaurant (which it recently acquired from a private owner and is in the process of revamping) and can direct guests to two nearby markets to purchase groceries and goods. As our time in Sedona wound down, we were happy to head back into town for dinner at Javelina Cantina. The restaurant provided the perfect spot to reflect on our trip over some Mexican comfort food. Although it was cold and rainy outside (which unfortunately meant we couldn’t enjoy the patio and view of the red rocks), inside it was warm, colorful, and full of happy diners. 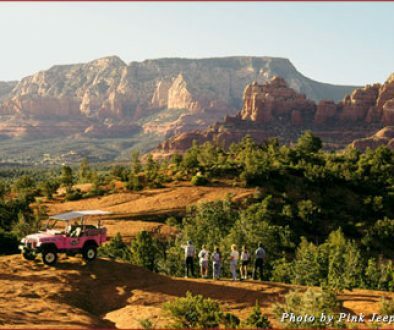 For many travelers in Arizona, Sedona is merely a place to stop for a few hours on their way to somewhere else. 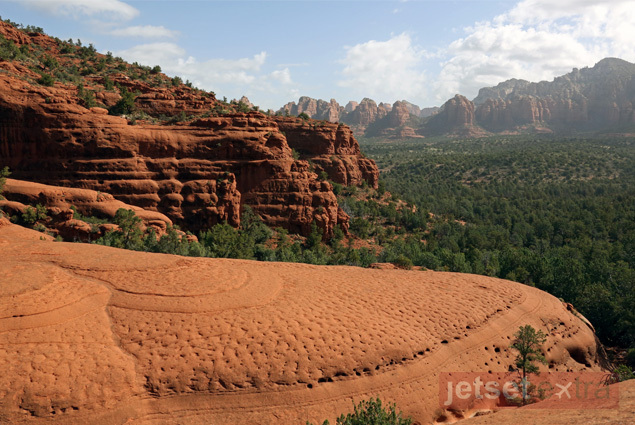 What I learned on this trip is Sedona is a destination in its own right, with welcoming accommodations, delicious food, exciting hiking trails, and plenty of opportunity to have your next adventure.